Mom and World Baby Hair Oil provides all-round nourishment to your little one’s hair and scalp. 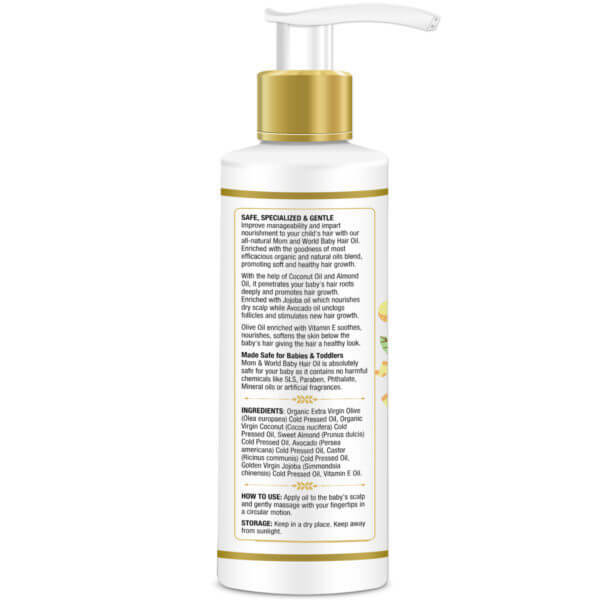 The antioxidant-rich oils in this product hydrate, moisturize and condition the baby’s hair and scalp. Special care has been taken to avoid any harmful ingredients or chemicals. This Hair Oil is hypoallergenic, which means it is not likely to give any allergy to your baby. 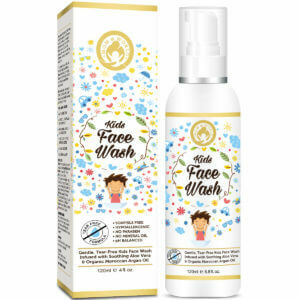 It has been made keeping in mind the sensitive skin and hair of the newborns, infants, and toddlers. Grown-ups and adults, too, will find this hair oil useful, thanks to its unique blend of cold pressed oils and vitamins. The multi-vitamins stimulate blood flow to the hair follicles and, thereby, promote hair growth. The result is a healthy scalp with soft, shiny, strong hair. So, use it with confidence, because your baby deserves nothing but the best. Why Do Babies Need Hair Oil? Newborn babies and infants usually have thin hair and a very sensitive scalp-skin that is susceptible to fungal and bacterial infections such as cradle cap (also called crib cap) in which the skin on a baby’s scalp becomes thick and flaky. The baby’s thin hair, too, needs proper nourishment for healthy growth. 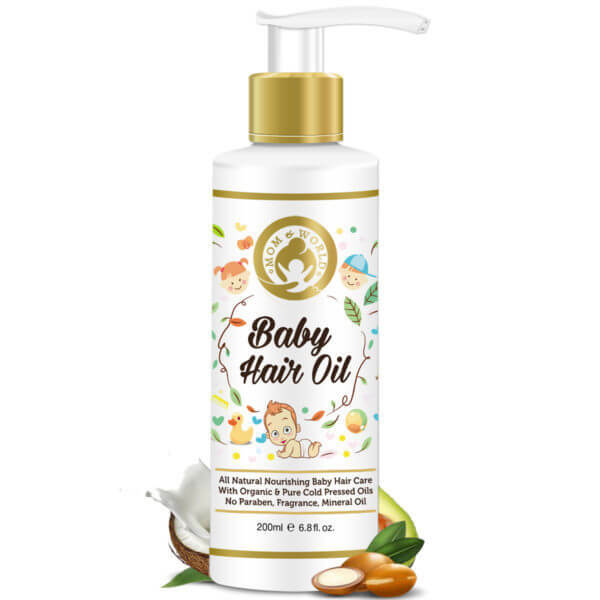 As adult cosmetic products should not be used on babies, the answer to any little one’s hair-care needs lies in safe, nourishing hair oil for babies, such as Mom and World Baby Hair Oil. Mom and World Baby Hair Oil is loaded with choice ingredients with scientifically proven benefits for hair and skin. 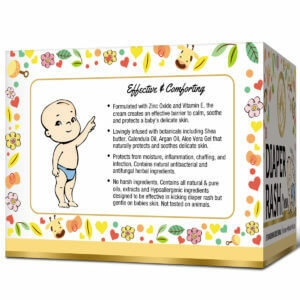 It contains a host of organic and pure cold pressed oils. The blend is enhanced with multiple vitamins. There are different kinds of coconut oils, but the one that doesn’t compromise with the coconut’s nutritional value is Organic Virgin Coconut Oil. What makes it special is the way it is extracted, by using the cold pressing method in which no chemicals, bleaches, additives, or preservatives are used for its refinement. It is this type of coconut oil which is used in Mom and World Baby Hair Oil. Coconut Oil has traditionally been used for hair nourishment and now scientific studies, too, point towards its benefits for hair. In a study comparing the effects of coconut oil on hair with other oils, it was found that coconut oil “reduces the protein loss remarkably for both undamaged and damaged hair” when it is used as a grooming product before and after wash. This happens because coconut oil has a high affinity for hair proteins and is able to penetrate well inside the hair shaft . This quality of coconut oil to reach hair follicles and reduce protein loss makes it ideal for Mom and World Baby Hair Oil. Olive Oil is obtained from the fruit of olive trees. Of the various types of olive oils, the purest and most superior is the Extra Virgin Olive Oil because it is extracted by the cold pressing technology. Extra Virgin Olive Oil has been scientifically validated for its powerful antioxidant quality because of its phenolic compounds . Antioxidants benefit our skin by scavenging free radicals that may damage skin cells. According to a scientific review, the phenolic compounds “inhibit the development of various skin disorders” and are a “promising tool in eliminating the causes and effects of skin diseases and skin damage” . This protective quality of Extra Virgin Olive Oil makes it a suitable ingredient in safeguarding a baby’s sensitive scalp skin. Sweet Almond Oil is obtained from the nuts of an almond tree. Traditionally, almond oil has been used in ancient Ayurvedic, Chinese, Greek and Persian medicines for dry skin conditions such as psoriasis and eczema. The benefits derive from almond oil’s anti-inflammatory and immunity-boosting properties . Jojoba Oil is also a good moisturizer for both dry and oily skin as it contains a compound which is similar to the sebum that our skin produces . So whether your baby has dry or oily skin, Jojoba Oil will give the much-needed nourishment to the scalp. 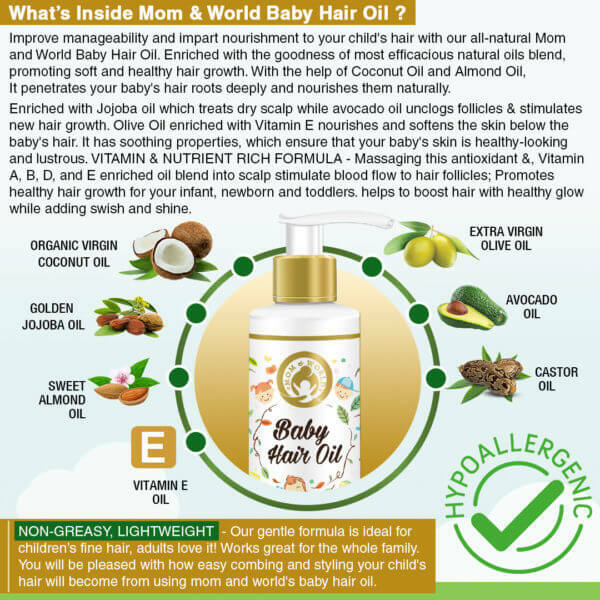 How Safe is Mom And World Baby Hair Oil? 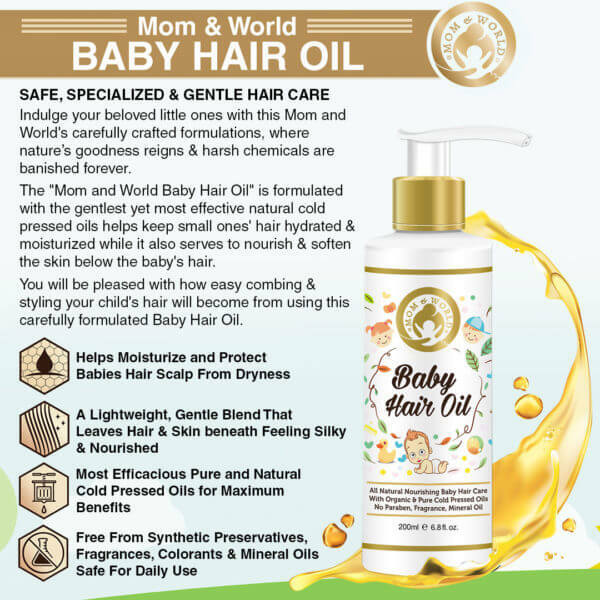 Mom and World Baby Hair Oil is completely safe for your little ones. 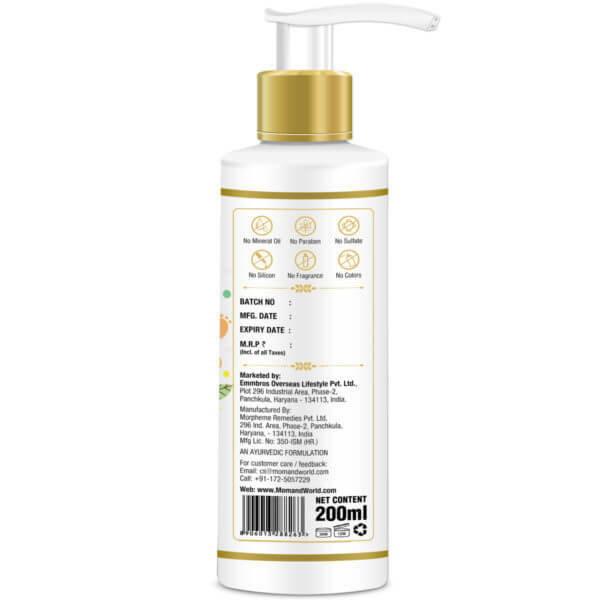 It contains no paraben, no mineral oil, no colors, no fragrance, no phthalate or SLS. All the oils in this product are cold pressed oils. They are pure and free of any chemicals, additives or bleaches. 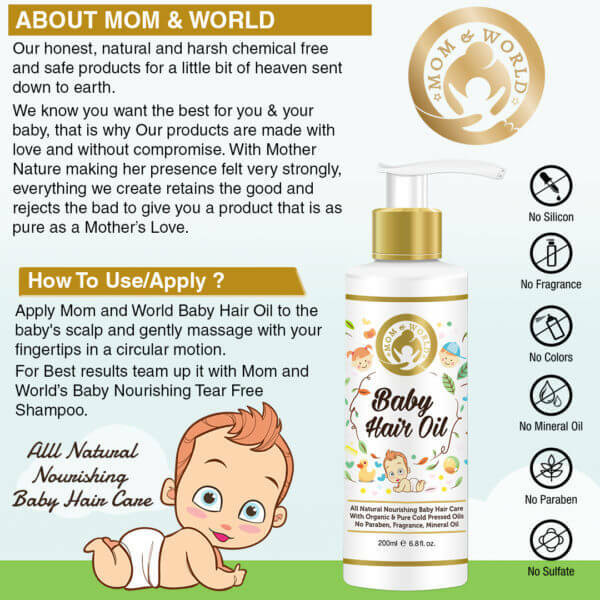 Apply Mom and World Baby Hair Oil to the baby’s scalp. Massage gently in circular motion so that the oil is absorbed by the scalp. Use the oil daily for healthy, shiny hair. This is a safe oil for the baby’s delicate scalp skin. I wanted to avoid mineral oil that is present in the hair oil of a number of well-known brands that’s why I selected this hair oil. It keeps hair soft and is supporting hair growth.